Most people don't necessarily think of Amazon when considering premium TV channel subscriptions, but with more and more people cutting the cable cord and moving to streaming services, Amazon Prime Video is an excellent option to get your favorite premium channels from one place. If you already have a Prime account, you can add premium channels like HBO and Showtime to Amazon's already expansive lineup. Begin by opening your web browser and heading over to Amazon. When you arrive, mouse over Account & Lists in the upper right of your screen, then select Sign in. When you arrive at the Amazon sign in page, enter your account username and password. If you have multiple accounts in your household, make sure you're using the account you want to stream from. Amazon will drop you back on the home page. Select Account & Lists again to display the menu, then select Your Prime Video. 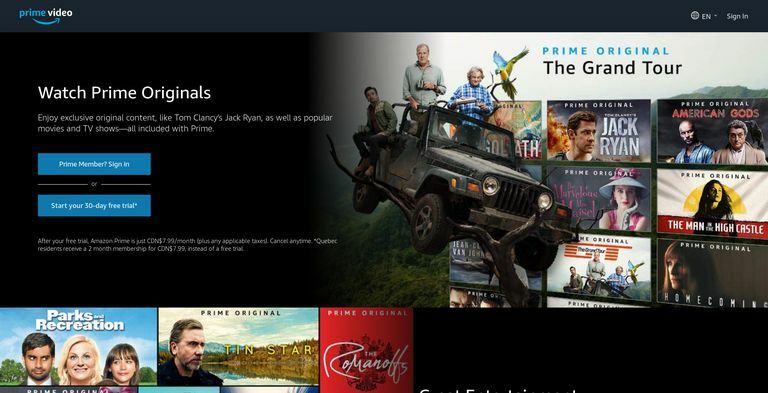 You'll arrive on the Amazon Prime Video home page. There's a large banner across the top of the page, a narrow menu, then a listing of videos in rows. Turn your attention to the narrow menu in-between and select Channels. The rows will shift to show featured content from some of the available channels on Amazon. While you might find the channel you're looking for right away, there's a more complete list. Scroll down until you see the Prime Video Channels row like the one pictured. Select See More to get the complete list. If you're having a hard time finding the Prime Video Channels row or Amazon's changed the layout a bit, use this link for the full list of Amazon Prime Channels. The channel listing consists of more rows of images broken down into categories. You can use the arrows at the end of each row to scroll through the category and see more options. Select the have one you want to subscribe to. Amazon will take you to your selected channel's page. Across the top is a massive banner image for your channel. Select it when you're ready to sign up. Amazon will take you to a splash page with information about your channel of choice, including the pricing info. More importantly, the page contains the link to sign up for the channel and begin your free trial. Select Start your 7-day free trial. You'll likely be asked to enter your account password one more time to confirm. Then, you'll arrive at a page breaking down your new subscription, including the subscription cost following your trial, more information about the channel, and your billing information. When you're ready, select Start your free trial near the bottom of the page. Now, you'll be able to view any content from your new channel from any of your devices that can access Amazon Prime Video. You can cancel your channel at any time through your Amazon account.